In a past life I played football at a fairly decent level – my initial career plan was to play for Barcelona and win a few Champions League medals by the time I was 30. But my knees had other ideas. And in truth I probably wouldn’t have been good enough to have forced Messi onto the bench. Seriously. At times I look back and think that if I knew some of what I do now around the importance of strength training and postural work, would I have gone further than being paid £90 a week (yes it was that long ago) to kick a football around for a few hours a day. I recently saw an infographic from premierinjuries.com and it broke down the most common injuries sustained by players in the premier league last season. Hamstring injuries came out at number one. I investigated this a little further and coupled with what I have seen and experienced in my own training and in coaching others, I have looked into the most effective movements to help deal with this. It is worth noting that if you have injured your hamstring before it would be paramount to take the following information on board as the rate of a reoccurring hamstring injury had been noted as being as high as 22-34%. At this point I would like to underline that this article won’t be an exhaustive piece on the mechanics of the injury, grades of strains and rehabilitation treatments. 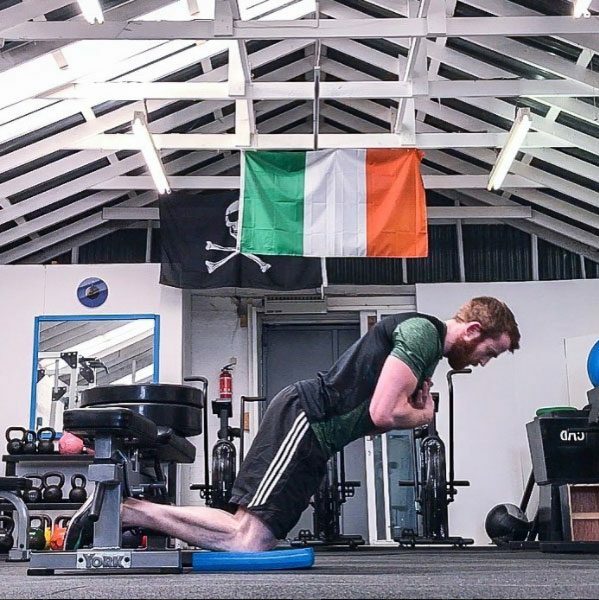 Instead it I will offer some of the best movements that have been shown to help strengthen the hamstrings and minimise the risk of injury or re-injury. Before we delve into these movements it is worth looking at some risk factors for hamstring strains or tears.. In the context of football, most hamstring strains happen just before the foot strikes the ground – when the hip is flexed and knee is extended (think in a sprint when the forward leg is reaching and about to land), at this point the hamstring is fully lengthened and near maximal activation. Incorporating resistance training in this range, and particularly eccentric work, will help the muscle gain strength through end ranges and create a buffer against injury. So what is eccentric training? The eccentric phase of a lift is when you lower the weight – lengthening the muscle under tension. Eccentric training is essentially lowering a weight in a controlled manner and this will depend on the tempo prescribed. In contrast, the concentric phase is lifting the weight (shortening the muscle). The advantages of eccentric training are that the muscles tend to be stronger in this phase of the lift – eccentric training helps improve the strength of connective tissues (tendons), improve range of movement, improve deceleration (useful for cutting and quick changes of direction – absorbing force). The downside of eccentric training is muscle soreness – which can peak two days after performing this type of training (the dreaded DOMS). With this in mind it is best off implementing this type of training earlier in the week, away from a game or depending on what level you are playing at, in the off season as part of a structured plan. It was briefly mentioned above but worth repeating in slightly more detail, eccentric training has also been shown to improve deceleration (absorbing force) – another phase where hamstrings can be extremely susceptible to being injured depending on the strength of the athlete and decelerating is an important skill in an intermittent sport like football especially when changing direction quickly and at sharp angles. So taking the above into account, it would make sense to train the hamstrings with a focus on the eccentric portion of the lift where possible. The following three movements are ones that should be implemented to some degree in a football players strength program to strengthen the posterior chain and minimise the risk of hamstring injuries or re-injuries. The Nordic Hamstring Curl is one of the main movements that has been tested in studies and that has proven to help minimise the instance of hamstring strains. The advantage of this movement is that it can be performed with no equipment and just a partner – although there are various ways to set this up in a gym setting (as demonstrated in the video below). This movement can be performed as part of a warm up and partner assisted or in a specific strength plan. Again, when the focus is on the eccentric portion of the lift, it is a good idea to ease into this with lower reps and sets. Also if there is a history of hamstring injuries, progress carefully. The Romanian Deadlift is another great lift to incorporate into a strength program for football. It is particularly beneficial for various reasons – it is a closed chain movement and it is performed while flexing the hip and keeping the knee almost fully extended – bringing the hamstring to an extended length under tension and mirroring the scenario when a hamstring strain is most likely to occur. Again when dealing with this movement it is important to lower the weight in a controlled fashion (a metronome can be good for pacing this) so as to increase the time the hamstrings are under tension. A Glute Ham Raise is another option but may not be practical in a field sport setting and not a lot of gyms have this bit of equipment. Some postural work may be implemented too as pelvic position will play a role in hamstring tightness – again in an optimal scenario, the athlete would be assessed and an individual program would be formulated. Unfortunately a program will never guarantee an injury free season but it will certainly increase the chances of one and help recovery throughout a long season. It is worth re-emphasising that eccentric training can be quite taxing on muscles and ideally this type of training would be performed in the off season or if it was being performed in season – earlier in the week away from a game so that any residual soreness would not negatively impact performance on game day. If you have any questions on this post in the comments section or get in touch!